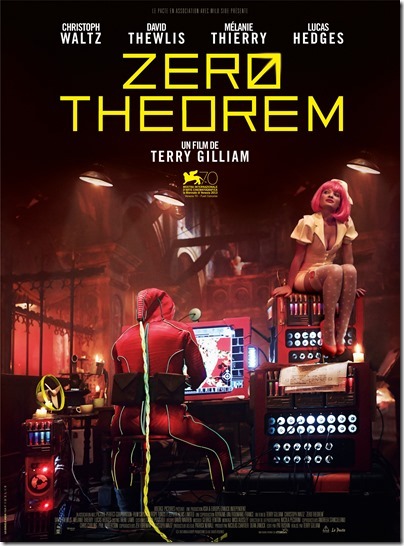 A few weeks ago I watch Terry Gilliam’s latest strange adventure called The Zero Theorem. In it, a sort of hacker, Qohen Leth (which is incidentally strangely close to “Qoheleth,” or Ecclesiates – the “gatherer; teacher or preacher”) is given a problem to solve with a strange computer program. He takes to this new problem by working alone in a massive abandoned church in the city. His goal is to isolate and persist uninterrupted. But he is interrupted regularly by his supervisor, a virtual call girl, and a whiz kid. He is given the opportunity to experience love and happiness and these moments pop up for him both in the world outside of his cathedral and inside the virtual world of his screen. Yet Leth persists in his obsession to crack the code of this “zero theorem” which is going to open an opportunity to get a phone call he has been waiting for – a phone call to tell him the meaning of his life. The search is all he has. And that is the problem. A life spent searching for meaning is a meaningless life. This is the fundamental truth of the film. If we spend our days taking quizzes to determine our strengths, personality type, the kind of introvert or extrovert we are, the best career for us, and so forth it is all a search for meaning which is an ultimately meaningless activity. A life of meaning is not one where we seek the meaning of our lives, but one where we do meaningful things with people. We don’t need to search for meaning in life. A life lived with others is meaningful enough on its own.